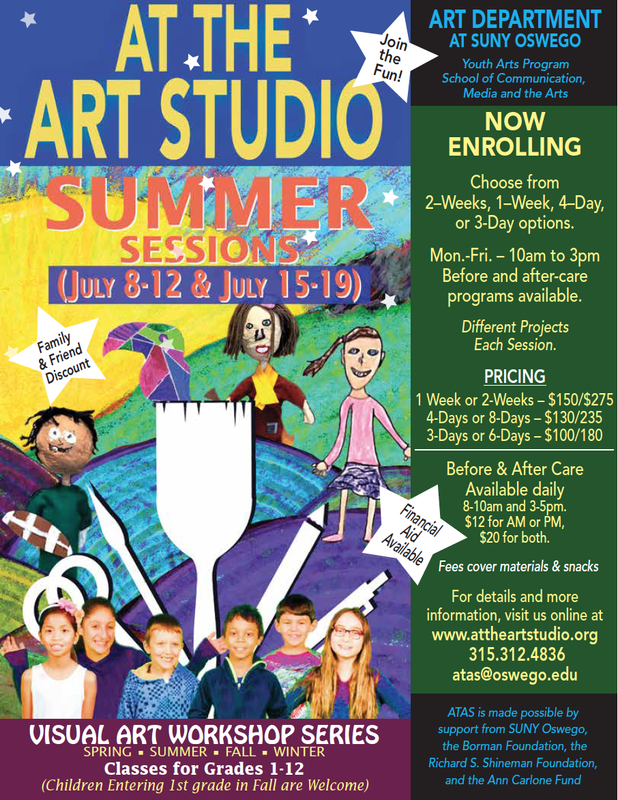 “At the Art Studio,” is a workshop series for children and young adults offered by the Art Department at SUNY Oswego. Participants will be instructed by faculty and graduate students from SUNY Oswego’s Art Education and Art Departments. Programming will vary for each age range and session. All sessions end with a display of the work produced and a reception for friends, family, and the general public. For the Summer we are offering two sessions the week of July 8th and July 15th. We offer multiple participation options for the summer sessions ranging from 2 weeks to 3 day. Scholarships are available for those with financial need. See our registration page for more information about our upcoming session. Give the gift of art! Inquire about ATAS Gift Cards. Interested participants are encouraged to register early due to limited space in each session. This program is made possible by support from SUNY Oswego, the Ann Carlone Fund, the Borman Foundation, and the Richard S. Shineman Foundation.